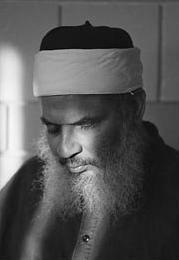 IHRC have recently spoken to the family of the blind Sheikh Omar Abdul Rahman, regarding his failing health and deprived prison conditions. The family have released a statement urging the Muslim community to become active in campaigning for the release of the Sheikh. Islamic Human Rights Commission (IHRC) has received unconfirmed reports from the family of Sheikh Omar Abdul Rahman, describing his horrendous circumstances. The blind sheikh also told his family that the prison authorities are giving him food and drink that contain pork and alcohol. Sheikh Omar has been imprisoned for 18 years, in which time his family have received permission to see him only once, despite numerous applications. There only form of contact is monthly phone calls that last twenty minutes. Ramsey Clarke who is currently the attorney for the Sheikh is barred from speaking to any external organization regarding the case, due to the conditions of his legal representation. If these terms are breached then Sheikh Omar will lose the right to any legal representation.